Last week I spoke at Mozilla’s Compatibility Summit. I spoke about compatibility data. Here are my slides. is information curated by web developers about the cross-browser compatibility of the web’s features. documents browser implementation of standards, browser anomalies (both bugs and features), and workarounds for common cross-browser bugs. It theoretically covers hundreds of browser/version combinations, but naturally tends to focus on browsers/versions with the most use. is partly structured (numbers and booleans can answer the question, “does Internet Explorer 10 support input type=email?”) and partly unstructured (numbers and booleans cannot say, “Safari Mobile for iOS applies a default style of opacity: 0.4 to disabled textual <input> elements.”). Compatibility data changes all the time. As a colleague pointed out last week, “Every six weeks we have all new browsers” — each with an imperfect implementation of web standards, each introducing new incompatibilities into the web. Web developers are often the first to discover and document cross-browser incompatibilities since their work product is immediately impacted. And they do a pretty good job of sharing compatibility data. But as I said in my talk: Compatibility data is an oral tradition. Web developers gather at the town pump and share secrets for making boxes with borders float in Browser X. Web developers sit at the feet of venerated elders and hear how to make cross-browser compatible CSS transitions. We post our discoveries and solutions in blogs; in answers on StackOverflow; in GitHub repositories. We find answers on old blogs; in countless abandoned PHP forums; on the third page of search results. There are a small number of truly canonical sources for compatibility data. We surveyed MDN visitors in January and learned that they refer to two sources far more than any others: MDN and caniuse.com. MDN has more comprehensive information — more detailed, for more browser versions, accompanied by encyclopedic reference materials. caniuse has a much better interface and integrates with browser market share data. Both have good communities of contributors. Together, they represent the canon of compatibility data. Respondents to our recent survey said they use the two sites differently: They use caniuse for planning new sites and debugging existing issues, and use MDN for exploring new features and when answering questions that come up when writing code. On MDN, we’re working on a new database of compatibility data with a read/write API. This project solves some maintenance issues for us, and promises to create more opportunities for web developers to build automation around web compatibility data (for an example of this, see doiuse.com, which scans your CSS for features covered by caniuse and returns a browser coverage report). Of course the information in MDN and caniuse is only one tool for improving web compatibility, which is why the different perspectives at the Compat Summit were so valuable. 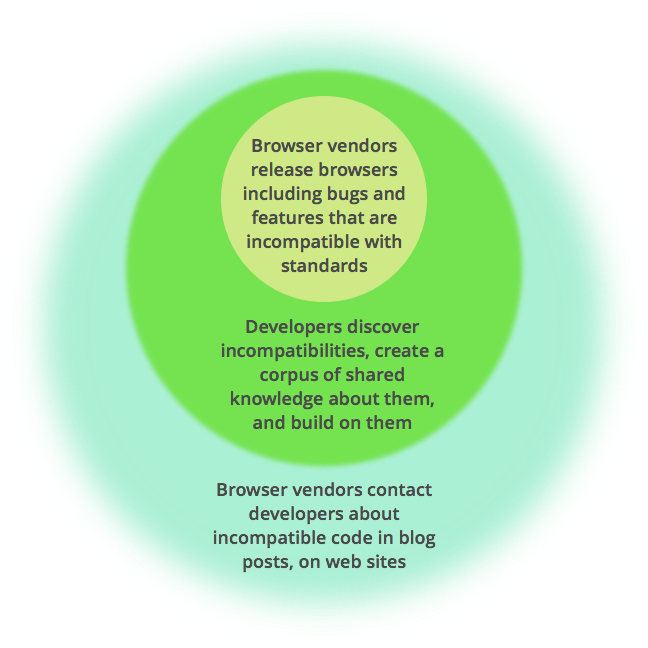 If we think of web compatibility as a set of concentric circles, MDN and caniuse (and the entire, sprawling web compatibility data corpus) occupy a middle ring. In the illustration above, the rings get more diffuse as they get larger, representing the increasing challenge of finding and solving incompatibility as it moves from vendor to web developer to site. By the time most developers encounter cross-browser compatibility issues, those issues have been deployed in browser versions. So browser vendors have a lot of responsibility to make web standards possible; to deploy as few standards-breaking features and bugs as possible. Jacob Rossi from Microsoft invited Compat Summit participants to collaborate on a framework that would allow browser vendors to innovate and push the web forward without creating durable incompatibility issues in deployed websites. When incompatibilities land in browser releases, web developers find them, blog about them, and build their websites around them. At the Compat Summit, Alex McPherson from Quickleft presented his clever work quantifying some of these issues, and I invited all present to start treating compatibility data like an important public resource (as described above). Once cross-browser incompatibilities are discussed in blog posts and deployed on the web, the only way to address incompatibilities is to politely ask web developers to fix them. Mike Taylor and Colleen Williams talked about Mozilla’s and Microsoft’s developer outreach activities — efforts like Webcompat.com, “bug reporting for the internet”. Should someone work to keep the importance of cross-browser compatibility visible among browser vendors and web developers? Special thanks to Jérémie Patonnier for helping me get up to speed on web compatibility data. I’m just grinning that someone has actually noticed that Safari Mobile note that I added to MDN ( https://developer.mozilla.org/en-US/docs/Web/HTML/Element/Input$compare?to=588017&from=572223 ) !